All Secure IT Services can assist you with identifying and assessing the threats and vulnerabilities and define a Business Continuity Plan (BCP). The purpose of BCP is to enable a business to continue offering essential services in the event of a disruption and to survive a disastrous interruption to activities. Rigorous planning and commitment of resources is necessary to adequately plan for such event. 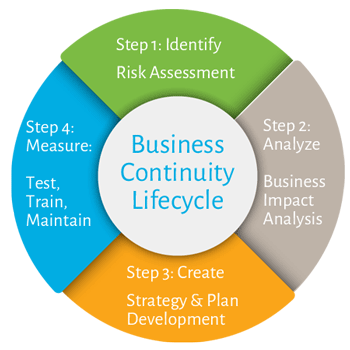 We work with senior management to assess threats and vulnerabilities to the business and define a Business Continuity Plan (BCP). The first step is to identify the business processes of strategic importance – processes that are responsible for permanent growth and for the fulfillment of business goals.